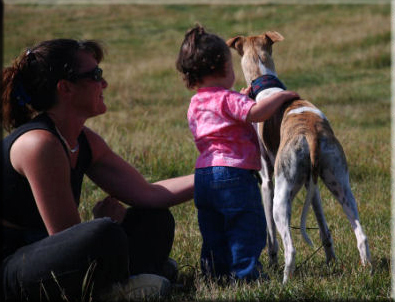 In 1998 I went to look at a litter of Whippets with my best friend Tracy. She'd had Whippets for years and was excited about getting a "blue male" from this litter. I took the other blue male from the litter and my love of Whippets was launched. That was Carter. He was a pet at best. He was not show quality and wouldn't leave my side to chase a lure but I loved him tons just the same. Within 6 months I had another Whippet, Bailey. I acquired him from John Griffith (Edgewater) and had a ton of fun with him. He won multiple Puppy Groups and Groups. Then John offered me a co-ownership on a female puppy. Of course I couldn't say no. So Dali came to live with me and I fell in love all over again. The rest, as they say, is history. I am thankful to so many people; Tracy Dineley, for introducing me to the breed. Her husband, Steve Sellwood, for showing Bailey to his Canadian Championship. John Griffith (Edgewater), for placing Dali, my "heart dog" and foundation for my breeding program, with me. I also have to thank Deann Christianson of Chelsea Whippets for freely sharing her knowledge of the breed with me. Thanks also to Sue and Alyssa Nordstrom (Lynallan) and Raymond Yurick. I am always eager to learn and hope to continue learning as long as people are willing to take the time to teach me.